“Chile is f***ing awesome!” the standing crowd repeated in unison. Coined by Fadi Bishara during a highly motivational talk, the phrase soon became the unofficial motto for Webprendedor. The Chilean digital entrepreneurship event culminated with a one-day conference in Santiago on Saturday after traveling all over the country last week, as you can read in our previous story “Why Valdivia, Chile Needed Webprendedor“. For those who missed the event or are in need of a recap, here are the key lessons you could have learned from the inspirational speakers at Webprendedor. Britt Selvitelle was one of the first engineers at Twitter, where he worked for five years before leaving the company last month. His talk at Webprendedor was called “Startup Dopamine: Working at a startup is like falling in love.” Participants listened with interest as Britt recalled the excitement of working with Ev (Williams), Jack (Dorsey) and other at the company. The perspective of working within such a dynamic team, he explained, got dopamine and norepinephrine flowing through his system. Britt likened the experience to the feeling of a first kiss. After a while, oxytocin took over the body, creating a lasting bond and preventing burnout. You may be thinking it’s quite obvious; after all, who wouldn’t be excited about joining Twitter? However, let’s keep in mind that things were quite different five years ago. The company Britt joined was then called Odeo and had been working on podcasting. As he recalls, most people he spoke to didn’t really get the point of its new product “Twttr“. Yet, Britt knew from the butterflies in his stomach that he was part of a team on the verge of big things. For Britt, anyone joining the right startup should feel like falling in love, but the comparison also works the other way around. “Don’t work with assholes,” he warned the audience – probably in the same way that you wouldn’t want to date one. Britt’s experiences of joining a startup are equally pertinent for those looking to launch one. You need to find people you can trust that share your vision; that was what Alexa Andrzejewski did to find her co-founder. Alexa told the conference the story of her food recommendation project, Foodspotting. She explained that she shared her initial idea with many people until she finally met Ted Grubb at a networking event in 2009. The pair immediately clicked and Ted became the co-founder and CTO of what went on to become a fast growing startup, registering one million app downloads in August. As Blackbox‘s founder Fadi Bishara pointed out, this is why it’s so important for wannabe entrepreneurs to share their projects. As we heard from Webprendedor participants, Chileans are often afraid to disclose ideas they’re working for fear that someone might steal them. Yet they shouldn’t worry about this, said Fadi, as ultimately it is execution that makes the difference rather than the idea itself. As the creator of the Cofounder Network, Fadi believes it is worth the risk as it is the only way to find people who share your vision and can work with you to make it a reality. If you’re looking for a co-founder, you should look for someone you trust and respect, a person who shares your values and whose personality and skills complement yours, Fadi added. Fadi’s Startup Genome initiative recently conducted a large scale survey asking more than 3,000 to find the “secret” of success (see our previous story “The Startup Genome Compass launches to help startups avoid failure“). Given his research, we can trust Fadi’s conclusion that “it’s all about the people” is certainly a significant success factor. Many Webprendedor’s speakers emphasized how easy it is to create a startup compared to a decade ago. Today, programmers and developers can use plenty of tools that weren’t available at the time. According to Britt Selvitelle, the cloud application platform Heroku is emblematic of this change and deploying an app is now much more simple. It’s also increasingly easier to scale thanks to the cloud, Britt explains the audience in a telling anecdote. When Justin Bieber joined Twitter in 2009, he recalls, his team was hugely excited yet also somewhat concerned as to whether the platform could handle the spike in traffic that the singer’s presence would draw. So when talking to a friend working at Instagram recently, he was surprised to hear the different experience which played out when the teen pop star started using the picture sharing platform a few months ago, immediately triggering thousands of new sign-ups. Instead, Britt heard, Instagram’s host Amazon contacted his team offering additional capacity in advanced of the user spike. Even better, is the fact that many of these tools are inexpensive or often free while product creation is a faster process than ever before. As PBworks‘ founder David Weekly noted in his workshops, it is now possible to launch a viable and well-designed product in just one week or even one weekend (see our previous story “Meet David Weekly, The Nerd Who Loves People“.) As a consequence, startups require less capital to get started with bootstrapping a great option. In many cases, money from your friends and family can go a long way and keep you going until you break-even. One of the secrets of Foodspotting’s success is its user experience. Before creating the startup, Alexa Andrzejewski was an Interaction Designer at Adaptive Path while CTO Ted Grubb was the UI Designer at customer-centric Get Satisfaction. Both are convinced that the ideal startup should be “UX-driven”, or in other words, “vision-driven” as Alexa’s excellent slides demonstrate here. That isn’t to say that sites should put all their focus on presentation, that is just one part of the user experience. According to InterSystems‘ Iran Hutchinson, usability should come first, after all features are worthless if a product performs poorly. This also translates to design as David Kadavy, who recently published a book called Design For Hackers, demonstrated by devote an entire workshop to white space. Although it is often overlooked, it is blank space that creates the “clean” look of many of our favorite products. One of the stand-out conferences speakers was David Boronat, who explained in detail how to create a persuasive product that will drive users. David’s experience, through his consultancy firm Multiplica, has seen him help companies like Groupon and Movistar increase website persuadability and customer conversion rates. His talk focused on key principles – “less is more”, “put your users first” – which were broken down into practical advice and illustrated by examples; his full presentation (in Spanish) is definitely worth reading. Even though creating a startup has become less expensive, many early stage startups need money. In Latin America, capital can come from a series of sources. One of them in Chile is the governmental organization CORFO, which manages several programs through which Chilean companies can apply for subsidies. CORFO is also in charge of Start-Up Chile, whose acceleration program and US$40,000 grant has attracted startups from all over the world. Besides these government initiatives, many accelerator programs have recently emerged in the region (see our post “9 Latin American Accelerator Programs You Should Know“.) One of them, the Argentine-based BA Accelerator, is run by Vanesa Kolodziej, who talked at Webprendedor about her experiences. Money, she said, is only one component of what an accelerator can offer, alongside mentoring, networking and assistance with fundraising. She also recommended participants to focus on the reasons why accelerators work. Besides the help they offer, their framework also gives entrepreneurs the opportunity to focus on building a product and their core responsibilities on a full-time basis, she said. By introducing deadlines to teams, they must work to develop a product in just a few months, allowing them to focus entirely on creating an investment-ready company. The experience may force them to fail fast or pivot if necessary. Did you know that Groupon recently acquired Chilean firm Zappedy for US$10.3m? Most Webprendedor attendees in Concepcion were unaware of the deal or had never heard of Zappedy. Given that Chile doesn’t have a huge number of high profile deals that was surprising and unfortunate. Webprendedor’s organizer Nico Orellana is convinced that success stories like this deal deserve more publicity. This is why Zappedy’s founder Francisco Larrain was at the Webprendedor conference in Santiago where he spoke of his experience. Francisco, who is now Groupon’s Director of Engineering, explained how his company, which offered e-commerce services to local merchants, was just 18 months old when Internet giant Groupon acquired it. Francisco wasn’t there to wow the audience however; his speech demonstrated that his company wasn’t build in a day. His break came about after the idea for his startup came to him three years before he made it a reality. He and the company learned and evolved along the way, moving to focus on its clients, whose trust was mandatory for the business to succeed. Webprendedor’s speaker list featured several other Latin American entrepreneurs who could serve as role models for aspiring startupers in Chile. During its time in the cities of Valdivia and Concepcion, the event highlighted a number of local projects such as Hablalot and ConcepcionPlus. The Santiago conference line-up included Argentine Ignacio Rovirosa, who’s in charge of Business Development at the online interview app startup OVIA, a 500 Startups company (see our previous post, Summer in the Valley for Latin America startups Ovia and Welcu.) His talk focused on the difficulties OVIA encountered during its development with Ignacio emphasising the need for perseverance to enable companies to pivot as OVIA did in its early days. A good idea, apparently: earlier today, the startup reportedly received US$2.5m in funding from the VC firm DCM. Start-Up Chile’s CCO Brenna Loury also reminded the audience that some of the program’s first graduates, such as CruiseWise, Junar and SaferTaxi, which already managed to raise large rounds of financing. Yet there will be more to come, said Brenna, who reminded that the program is set to welcome 1,000 new startups by 2014. 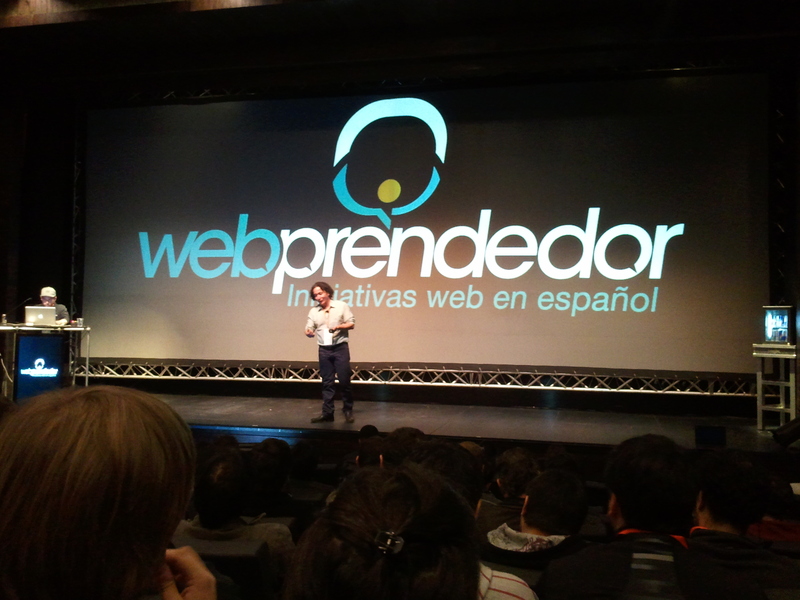 As David Weekly reminded Webprendedor’s participants, one of Chile’s main assets is its image. Those in Silicon Valley associate the country with great wine, delicious food, stunning outdoors and hiking opportunities. Yet there is also a growing awareness of Start-Up Chile, proven by the fact that 35% of the companies scheduled to take part in the program’s next batch are from the US. According to Nico Orellana, himself an entrepreneur at Welcu whose team is organizing Webprendedor, Chile also has great talent. One of Webprendedor’s main purposes is to stimulate talented students to inspire them to work on their own startup projects. What Chile needs the most is a community. If entrepreneurs get to know each other better, those who succeed can pass on lessons and serve as role models to the next generation. This generational aspect is very important, and a key element of Silicon Valley’s success is its pay-it-forward culture with each generation mentoring the next. As David Weekly reminded Webprendedor’s attendees: “You don’t need to wait until your startup’s IPO to start helping out; there’s already someone around who knows less than you do, and you can help them now.” Events like Webprendedor are the kind of initiatives that can make a difference and help Chile’s startup ecosystem to grow and thrive. Have you attended Webprendedor or watched the conference’s live stream? Let us know of your experiences and highlights from the show.